Unlike some other online casino games, Live 3 Card Poker is not based on luck but rather there is an element of skill involved in your hand selection adding a strong element of fun making it a popular choice. How do you play Live Three Card Poker? Two bets are made before any cards are dealt, namely the ante and pair plus bets. The ante bet is against the dealer, while the pair plus bet pays out for poker hands of 1 pair or better. After you have placed your bets, you and the dealer will be dealt three cards and you must then decide on whether you want to play or fold. You don’t get to see the dealer’s hand so you have to make your decision based on your own hand solely. If you decide to play your hand then you must place another bet equal to the ante. You hand will then be compared to the dealer’s 3-card poker hand with 1-to-1 paid on both the ante and raise bets if you succeed in beating the dealer and the dealer’s hand qualifies. To qualify, the dealer must be holding a queen high or better. How to win at Live 3 Card Poker? Your main aim when playing games is to win and if you want to win some money, then you would need to know how to play Live 3 Card Poker optimally. Knowing what to do will help you win as well as increasing the chance of hitting a big wining hand. Queen high, when your second card is a 6 and your third card is a 4 or higher. 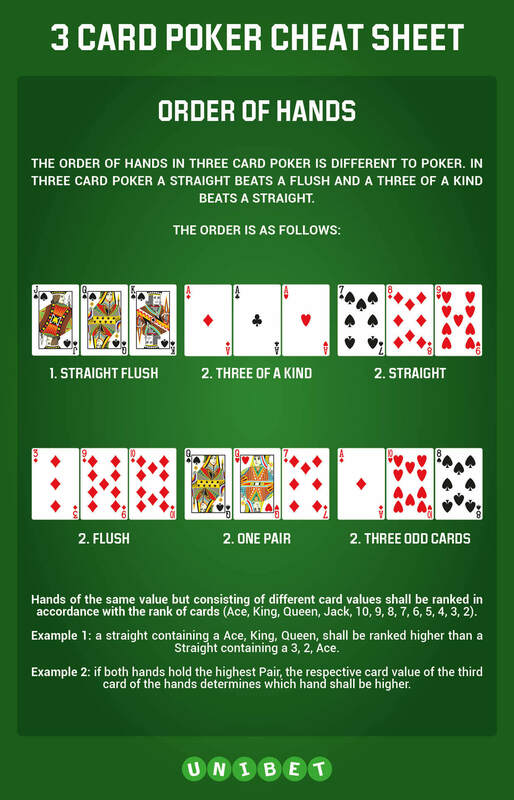 Granted that if you play only those higher hands, it would mean that you have to fold all others. If you are looking for a bigger win at Live 3 Card Poker, you might want to put into regular use the pairs plus bet. The ante bonus on the regular play also provides the chance of reasonable wins too. One thing you need to keep in mind when it comes to pair plus is that your wins and losses can be more volatile than in ante play.